See the letter from publishers to the Guardian opposing the closure of Middlesex University’s Philosophy Department and the suspension of staff and students. See an article in the Bookseller on the same. An article in the Times Higher on the closure and suspensions. 3. This morning, professors Osborne and Hallward were denied managerial permission to attend an emergency meeting of their union, the UCU, scheduled for Friday 28 May. They were also denied permission to attend the UCU annual general meeting scheduled for next Wednesday, and a meeting of the University’s self-constituted Professors Group. 4. Collective pressure to greylist i.e. boycott Middlesex University is growing rapidly. The external examiners for the Middlesex Philosophy department have already announced their refusal to collaborate with next month’s assessment boards, and colleagues in other departments may soon follow suit. A boycott by external examiners will have a significant and immediate impact on the University. 5. Confirmed speakers for the rally at Hendon on Thursday 27 May from 4pm include Alex Callinicos (KCL), Richard George (Campaign for Better Transport; Plane Stupid), Paul Gilroy (LSE), Nina Power (Roehampton), Jim Wolfreys (UCU), among others. Please circulate the rally announcement and flyer (http://savemdxphil.com/) to everyone who might be sympathetic. New Occupation at Middlesex University! This evening around 50 students and staff from half a dozen different programmes at Middlesex University’s School of Arts and Education occupied the library at Trent Park campus. This building is full of books on philosophy, literature, art criticism, music and culture. These books – and the courses and departments associated with them – are severely endangered by management cuts. We are determined to preserve them. 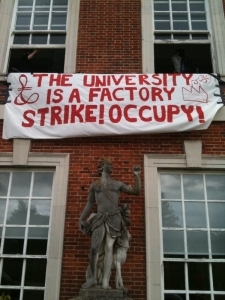 At 8pm on Friday 14 May 2010, Middlesex University management served a High Court injunction to end a twelve-day student occupation of the Mansion building at Trent Park. The occupation began on Tuesday 4 May, when Philosophy students gathered to protest the management’s abrupt decision to close their unique and successful programmes. The occupation quickly succeeded in focusing remarkable levels of national and international attention on the scandalous situation at Middlesex. The injunction came into effect at 8am on Saturday 15 May. The students finally decided to end their occupation on Saturday afternoon so as to join a rally, outside the Mansion, in support of the campaign to save philosophy at Middlesex. During the rally, Tariq Ali and members of the campaign spoke out forcefully against the management’s decision to close the programmes, the way this decision was taken, and the way its consequences and implications have been handled. Read the rest, and complain to the governors, here. We are happy to welcome Eyal Weizman, the Director of the Centre of Research Architecture at Goldsmiths, to the Mansion Occupation on Friday evening. He will be participating in a roundtable on the subject of ‘The Spatiality of Occupations’. Dr Weizman will be speaking on Palestine, Paulo Tavares on the Amazon, Godofrendo on Portugese occupations, and Lorenzo Pezzani on Italians in Libya. The discussion will take place at 8pm. The campaign continues with thousands of signatures to the petition, the continued occupation and vast amounts of coverage – just a fraction below. Do keep up on the latest by checking the website. Article in yesterday’s Observer, including info on letter signed by Badiou and Zizek. (Although note this qualification). Article by Lynne Segal in the Guardian. Article in last week’s Guardian. Article in last week’s Times Higher. Sign up to the Facebook group. See also infinite thought’s blog for more info (please note the change of url). On Wednesday 6 May, after a rally in support of the occupation of the boardroom at Trent Park, the occupation expanded to take over the whole of the main building on the Trent Park campus (the Mansion building). The students explained their intentions and demands in an open letter, at http://savemdxphil.com/2010/05/07/open-letter-to-middlesex-staff-faculty-and-students/. On Thursday afternoon 7 May, Middlesex administrators finally met with the students (on condition that no member of staff attend as a silent observer); they apparently confirmed their decision to close the undergraduate programmes, and to freeze recruitment to the graduate programmes. The meeting ended in an impasse. Since Wednesday evening, the students have been organising a series of informal events in the occupied Mansion building: improvised concerts, discussions, lectures on a variety of topics (Spinoza, Lacan, student and university politics, the mobilisation in Iran…), political film screenings, etc. The current schedule is posted near the top of http://savemdxphil.com/. If you can get to Trent Park this weekend it’s become an interesting place to visit. The Guardian has a story on the protests and the occupation, at http://www.guardian.co.uk/education/2010/may/07/philosophy-cuts-closures-middlesex-university. The Facebook site has a few photos, etc., http://www.facebook.com/group.php?gid=119102561449990&v=photos, and now has more than 10,000 members. Some of the many letters of support we’ve received are now posted at http://savemdxphil.com/letters-of-support/, and we’ll be posting more letters over the weekend; it’s been impossible to keep up with the flood of email. Some of the most recent letters have been signed by entire departments. Academics fear closure will follow for the Centre for Research in Modern European Philosophy, which was Middlesex’s highest-rated department in the 2008 research assessment exercise. A Middlesex spokesman said no decision had been made about the centre’s future. In a letter to Times Higher Education published this week, 30 leading academics say the “abrupt closure” of Middlesex’s programmes is “a matter of national and international concern”. The signatories include: Slavoj Žižek, co-director of the International Centre for Humanities at Birkbeck, University of London; Alain Badiou, emeritus professor of philosophy at the Ecole Normale Superieure in Paris; and Gayatri Spivak, university professor in the humanities at Columbia University in the US. Middlesex staff and students received a shout-out at Sheila Rowbotham’s packed-out talk at the LRB Bookshop to launch Dreamers of a New Day last night. “Last week, we were invited to a meeting with Dean of Arts Ed Esche and Deputy VC Margaret House at 10.30 on Tuesday 4th May (the day before our deadlines), to address our concerns about the closure of our Philosophy Department. Rearranging our commitments at great inconvenience to ourselves, we arrived at the campus for the meeting, only to find it that they had cancelled it the night before. Security attempted to stop us entering the corridor and called the police, however the police decided to take no action. The students are now sitting in the board room (around 5 feet from the Dean’s office door), waiting for the Dean to show up and address our concerns.